Although Python is a very readable language, you might still be able to use some help as a data science student or beginning data scientist. 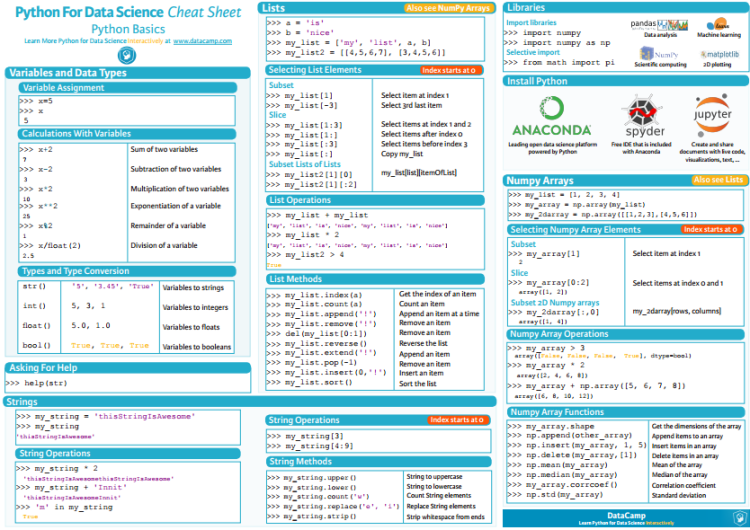 So, that's enough reason for me to make a cheat sheet for Python for data science, especially for beginners. It can serve as a quick reference for those of you who are just beginning their data science journey or it can serve as a guide to make it easier to learn about and use Python. How do you mean @Dmitry Zinoviev? This cheat sheet was meant to be Python 3. You should have mentioned that this is Python 2.7. It is a good starting point to get acquainted with Phyton, great share!